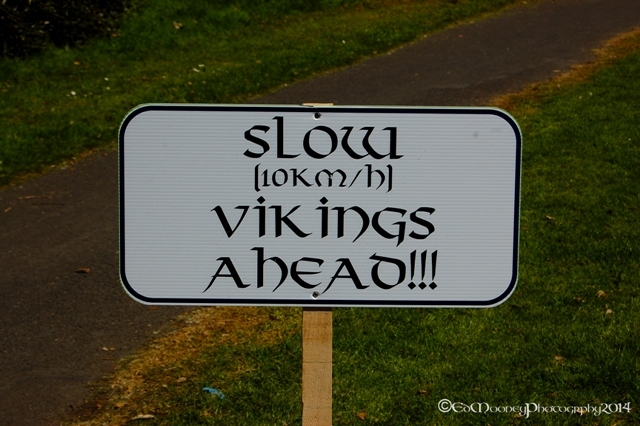 Vikings Back in Dublin……. Blood will flow. What a busy Easter weekend it has been, even with the extra day off work im still exhausted. 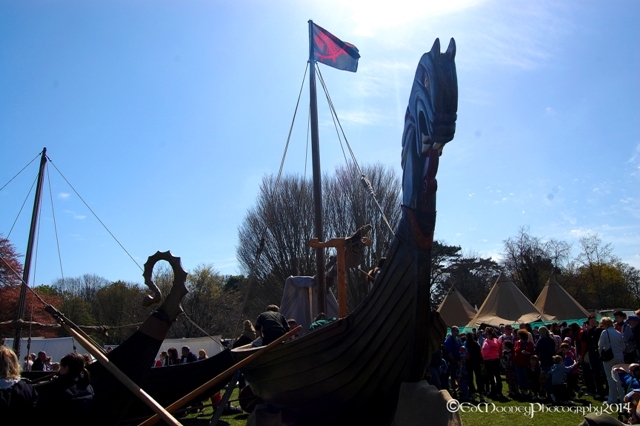 After the Easter Egg Trail in Merrion square with the family, was time to pay a visit to the Viking festival in St. Anne’s Park, Raheney. Unfortunately the wife has no interest in such things and the three kids were worn out, so I did not get a chance to show them what their Daddy did for fun back in the day before I had to grow up and be responsible. I’m sure that I will get another chance. The event in the park was part of the Brian Boru Millenium Festival and was organised by the Dublin City Council and was probably the largest Re-enactment event I have ever seen in Ireland. Having been involved in re-enactment for a number of years this event was well organised and could compete with many of the big shows in the UK and further afield. After been dropped of at the gate of the park I had to endure what felt like a ten mile walk to the staging area of the show. I was actually suprised at the sheer size of the event, it was definitely much larger than I had been expecting. The volume of spectators was also a bit overwhelming as I am not used to being on the civilian side at such events, but that’s the way it goes. So I started of on the outer part of the site, circling and moving inwards each time. There were re-enactors everywhere, from combatants to traders, blacksmiths, and crafter of all disciplines. Each tent or stall I stopped off at, was manned by genuinely authentic living history people. These guys once at a show will live, eat, sleep, fight, drink and sh$t living history. Everything you see will be the genuine article and historically correct. It is these people that the full credit for such a successful show must go too. I can say this because I know how much time, energy and money is given by each and every participant to be involved. So a big thank you to all the Living History/Re-enactors who came from far and wide to participate in the weekends festival. If you still have no idea as to what I am talking about, then check out my recent post on The Battle of Clontarf which will explain everything. Continuing on the festival is a part of many events being held around Ireland this year to celebrate the Battle of Clontarf 1000 years ago. 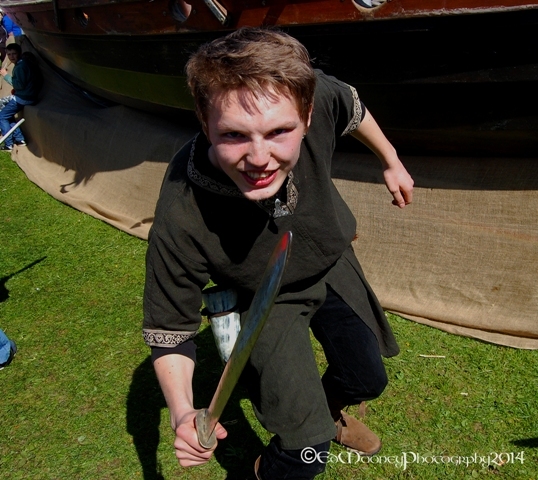 There was something to do for everyone at the event, with Viking Longboats, Archery, Coin minting, Birds of Prey, Archery, Smithing, not to mention the many stalls selling Viking jewellery, clothes, crafts and even weapons. For kids there were a number of workshops available were the could learn archery or even make their very own wooden sword and shield. There was far too much going on to see everything in the few hours I had to spend, but I did my best. The separate area for food, which I was badly in need of was seriously overcrowded and queuing would have taken over an hour, so I had a quick smoke instead and followed a few warriors back to the battle staging area. The crowds around the area sectioned off for the main event, being the re-enactment of The Battle of Clontarf was in most parts eight deep, so I was sure glad that I followed the Viking warriors to the field as I managed to get myself right up to the edge. Even with this I would have given my right arm for a good super zoom lense. With the battle field being so big I was difficult to get certain shots, but I hope that you like what I got. The battle itself was fantastic and I had to use any remaining willpower I had left to drop the camera , grab a weapon and join in the foray. I am really missing my old re-enactment days at the moment, I guess its still in my blood. After the Viking hordes were well and truely defeated buy the Army led by Brian Boru, I did a quick circle of the site to make sure I did’nt miss anything. To my suprise I met an old friend whom I havent seen since the Celtic New Year celebrations last year at Tlachtga and Tara for Dark Moon Samhain. Con was also a member of my Re-enactment group back in the day, so it was great to see him still involved. 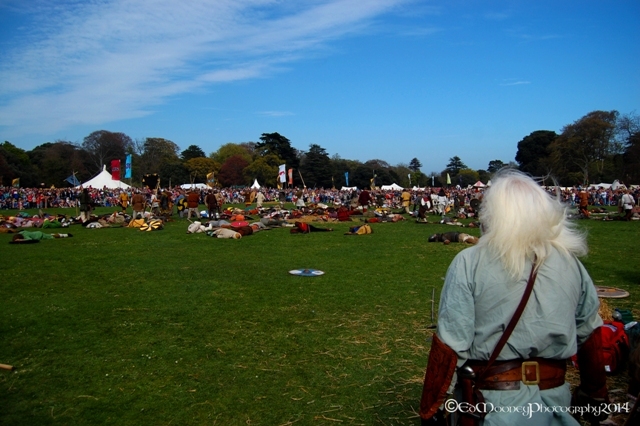 This entry was posted in Events, Historical, Medieval, People, Photography, Street Photography and tagged Battle of Clontarf, Dublin, festival, Ireland, Nikon, Photography, Travel, Vikings. Bookmark the permalink. That looks like a lot of fun. I bet you could get a lot of shots to use in some really cool composites. We have lots of Civil War re-enactments on the East Coast of the US, but that only goes back 150 years. 1000 years!!! So Cool! This is great. We love the Viking series on History channel. We would’ve loved to be there to see this re-enactment. Fun! It’s the Vikings! The Vikings are coming! You are too old, too grown up to actively participate in similar events? On the medieval markets I attended so far there were a lot of people older than you still running about in full gear – not always active participants and only spectators, but still. Though I do understand that you need to put a lot of work into this and with children it probably gets even more complicated. Unfortunately nearly all of the the ones I’ve been at so far were in Germany (one was in Poland, but I can barely remember it), though I wouldn’t mind visiting some abroad. great fun!! I saw their history in the Orkneys as well!! So glad you enjoyed the re-enactment!! It was one of the biggest I have attended…….. ever. Looks like I missed a fabtastic event! At least I got to live it through your slide show…thanks Ed! What struck me was how colourful everything was, from clothing to decorative shields; is that authentic? It sure was, I was only able to make it for one day, but thoroughly enjoyed it. The show really brought back many fond memories. It felt like a lifetime ago, but its only been nine years since I last swung a sword. I was so tempted to swap the camera for some kit and a weapon. Color was a big thing back then, even in Ireland color was very popular, and this showed in every aspect of life from dress to how their shields were decorated. It was also a sign of wealth. You probably know that purple has long been known as the royal color. Well this was mainly due to the fact that it was the most expensive color to dye. The irish used a certain shell fish to get this color which made it very expensive. That’s amazing, Ed! I envy you that experience! What got you into it in the first place? I lived a little history myself this weekend; I cooked Iron Age style, research for a post I’ll be writing soon, and it gave me a great feeling of satisfaction…even if the finished result wasn’t quite what I expected! My family played along quite enthusiastically…I’m lucky they humour me so much in my journey into the past. Would you not take the re-enactment up again, or would it take you away from your family too much? I would probably be easily tempted to pick up a sword on the odd occasion, but I dont think that I could commit the amount of time needed to do it to the extent that I used to. It takes huge amounts of time and money to keep everything right.